I love Thanksgiving. It seems that frequently when we get together with family, there are presents involved. Whether it’s birthdays or other holidays during the year, very often my parents or my in-laws are giving the kids a present for some reason or another. Don’t get me wrong, I’m thankful to have such great people in our lives, but Thanksgiving is a time when there are no presents and the focus is reflecting on what we have and how lucky we really are. I also love the food on Thanksgiving. But, many of my favorites have been traditionally made with canned soup, canned beans, sugar, and bread, which are no longer part of my diet. A little scouring of the internet and some kitchen creativity was needed to find tasty alternatives to some of my favorite recipes. Roughly chop bread into bite-sized pieces. Place the pieces on a large baking sheet and place in preheated 300° oven. Cook on low temperature until dried out, about 50 minutes. The bread should be a bit more moist than croutons, but not soft. 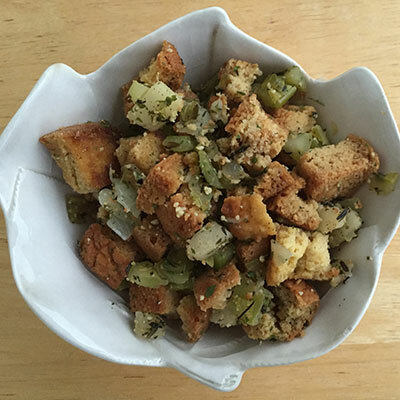 This step will help the bread retain its shape in the stuffing, so don’t skip it! Alternatively, you can dehydrate in your dehydrator, 130F for 24 hours. Preheat oven to 350F and lightly grease a casserole dish with oil of your choice, I used Perfect Coconut Oil. Heat butter, or oil of your choice, in a large pan on medium-high heat. Add onion and cook until soft, about 5 minutes. Add celery, thyme, rosemary, sage, pepper, salt, ginger and cinnamon. Cook for another 2-3 minutes. Add apple and cook a couple more minutes until just tender. Pour the broth over top of the bread. Again, be sure not to over mix just toss, then add to the prepared casserole dish. Remove from the oven and let sit with the cover on for 5 minutes. If you like a moister stuffing, add more broth to taste. Lightly oil a 9×13 loaf pan with coconut oil. Set aside. Add egg whites to a mixing bowl. Whisk on medium-speed for 2 minutes, until frothy. In a separate bowl, add egg yolks, coconut milk and gelatin and beat on high, until smooth. Combine the above two and add melted coconut oil, vinegar, and coconut sugar. Mix until just combined. In a separate bowl, mix coconut flour, baking soda and salt. Add to wet ingredients and mix until well combined. Transfer batter to a prepared bread pan. Smooth out with a spatula or the back of a spoon. Bake for 45-50 minutes in preheated oven, or until a toothpick comes out clean. Low-Carb Bread & Paleo Stuffing recipes inspired by healthfulpursuit.com. Blend cranberries and juice in blender or food processor until very smooth. Place in a pot and bring to a boil. Add coconut sugar and stir. Adjust sugar amount to desired sweetness. Add the gelatin to 1/2 cup water and let it sit 1 minute. Add to cranberry mixture and stir until completely dissolved. Check for sweetness and add more sugar if desired. Remove from heat. 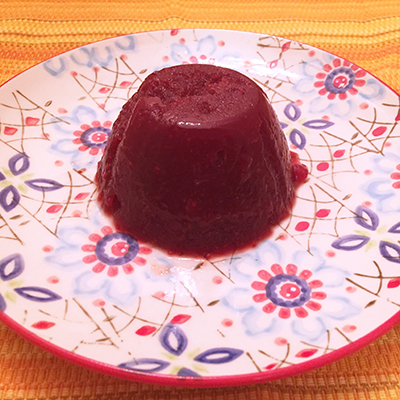 If putting in molds, coat the inside with melted Perfect Coconut Oil (cranberry sauce comes out of the mold easier). Pour into molds or dishes and place in refrigerator until well chilled. If having trouble removing from molds, then place mold in hot water for a couple minutes to loosen it up. 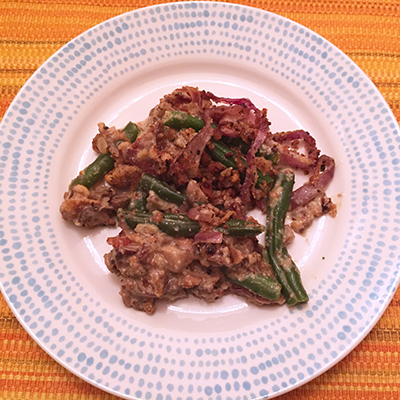 This recipe was a huge hit with everyone, even people who don’t usually like Green Bean Casserole! It is a combination of recipes from wellnessmama.com and fedandfit.com. Put a large pot of water on the stove to boil. Cut green beans in half and boil for 5 minutes. Strain and set aside. Add chopped bacon to a hot buttered or oiled saute pan and cook till just crispy. Add shallots and saute till slightly clear. Add the garlic, saute a couple more minutes. Add the mushrooms and stir frequently until they have cooked down. Using the same pan, add 1 Tbsp EVOO and 1 cup of the cream, coconut milk or almond milk and stir with a metal whisk. Add 1/4 cup of the almond meal and whisk until smooth. Add the rest of the cream and almond meal, whisking over a medium simmer. Whisk in tapioca flour and stir until the thickness of heavy cream. Reduce heat, add the mushroom mixture back in and stir. Pour the mixture in a medium size casserole dish. Top with prepared onions and cover. Bake for 15 minutes. Remove cover and bake for an additional 5 minutes. Beat eggs and cream or coconut milk. Add onions and make sure they are thoroughly coated. Use tongs to grab a bunch of the onions from the eggs. Let it drain a bit so it’s not dripping and drop onto the almond flour plate. Toss until evenly coated. Move to frying pan and fry until crispy, stirring frequently. Move to paper towel lined bowl or plate and set aside. Repeat until all onions are cooked.